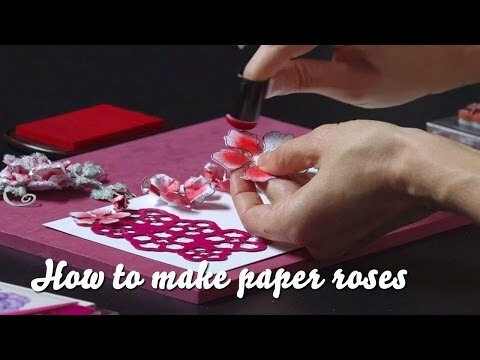 To see how to shape the roses, watch the tutorial here. Instructions: Take two 12 x 12" piece of gray cardstock and score it at 4 and 8" turn it and score again 4 and 8". Cut off the corners on both papers, then take a piece of 11 1/4 – 11 1/4" and score this at 3 3/4 and 7 1/2" turn it and do the same again! Cut these corner off also. Now glue them all on top of each other first the 2 big ones and then the small one. Decorate all the panels with paper from the collection. You can make some pockets too, and fussy cut tags of your choice adding gold thread if desired. Glue the wedding couple in the middle of the box using hot glue. Diecut medallion out of gray cardstock using medallion die. This medallion will be placed behind the wedding couple to create a fence effect. I used strips of clear acetate folded in half and glued the medallion onto the strips of acetate to allow it to stand up. Stamp Roses and leaves in Versafine Black ink and diecut with coordinating dies. Using the stack and store daubers, color leaves in Bamboo Leaves with light touches of Vintage Photo and Flowers in Picked Raspberry. Shape using Deluxe flower shaping kit following video for shaping flowers. Add desired flowers and leaves in front of couple. Lid: Using gray cardstock cut out a square of 6 1/8 – 6 1/8" and score at 1 inch all the way round, on one side use a scissors to cut two times one on the left corner and one on the right corner just to the score line, on the opposite side of the square and repeat this process. Fold along the score line and add glue on tabs to shape lid. Cut pieces of patterned paper on top and sides of the lid and box. Take the ribbon and create a bow and adhere this on top of the box. Arrange flowers and adhere onto lid as well as dove embellishment. Add lace along all sides of the lid. Add Nuvo drops in centers of small flowers and dots around as desired.